Emma enjoys teaching the flute at her home in Letchworth, North Hertfordshire. Her pupils range from complete beginners to music college students; young children to adults. Emma holds a Licentiate of the Royal Academy of Music (LRAM) teaching qualification, with Distinction. Emma tailors her teaching approach carefully to the needs of each individual pupil, spending a lot of time planning outside of lesson time. She has taught at institutions including the Junior Royal Academy of Music and Trinity Laban Conservatoire, and has been invited to give numerous masterclasses. She also teaches the flute for Cambridge University, preparing students for end of year recitals and music college auditions. Her younger pupils have gained places in the National Children’s Orchestra, National Children’s Wind Orchestra and at Junior Trinity. This year she has been invited to work at Trinity Laban Conservatoire on two occasions: the first time to teach a masterclass; the second to adjudicate the Final of the Harold Clarke Woodwind Prize 2018. 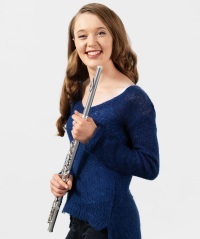 She was also invited to tutor the Yorkshire Young Sinfonia flute section at their 2018 course, working alongside professors from various UK music colleges. Alongside her teaching career, Emma has a busy freelance performing career as a soloist, chamber and orchestral musician.